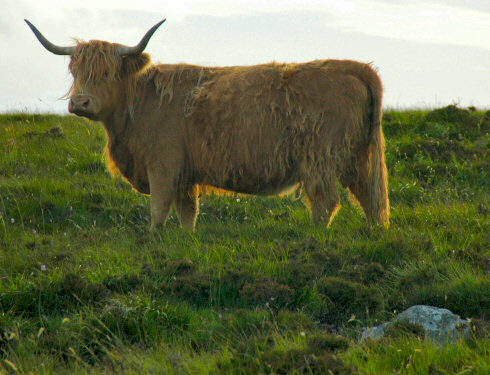 In the comments to last weeks Islay Blogging Roundup #3 knitting blogger Moggle mentioned she had wanted to get a picture of a hairy highland cow, but didn't get a chance to take one. So I thought I help out and post one this week. It's not very hairy, but I quite like the light, the mild evening light. This picture was taken near Braigo (at least I think that's where it was, as far as I can remember) on the way back from Sanaigmore after a very nice late afternoon walk in June this year. Actually, the same day the pictures of the goat were taken. Have a great weekend, whether it involves Highland Cattle, knitting, Single Malt Whisky or not!